ISIS fighters are close to defeat in the twin capitals of the group's territory, Mosul in Iraq and Raqqa in Syria, and Abu Bakr al-Baghdadi is steering clear of both, hiding in the desert between the two. A $25 million reward is offered by US to bring him "to justice"
ISIS leader Abu Bakr al-Baghdadi is on the brink of losing the two main centres of his 'caliphate' but even though he is on the run, it may take years to capture or kill him, officials and experts said. ISIS fighters are close to defeat in the twin capitals of the group's territory, Mosul in Iraq and Raqqa in Syria, and officials say Baghdadi is steering clear of both, hiding in thousands of square miles of desert between the two. "In the end, he will either be killed or captured, he will not be able to remain underground forever," said Lahur Talabany, the head of counter-terrorism at the Kurdistan Regional Government, the Kurdish autonomous region in northern Iraq. "But this is a few years away still," he told Reuters. One of Baghdadi's main concerns is to ensure those around him do not betray him for the $25 million reward offered by the United States to bring him "to justice", said Hisham al-Hashimi, who advises Middle East governments on ISIS affairs. "With no land to rule openly, he can no longer claim the title caliph," Hashimi said. "He is a man on the run and the number of his supporters is shrinking as they lose territory." Iraqi forces have retaken much of Mosul, the northern Iraqi city the hardline group seized in June 2014 and from which Baghdadi declared himself "caliph" or leader of all Muslims shortly afterwards. Raqqa, his capital in Syria, is nearly surrounded by a coalition of Syrian Kurdish and Arab groups. 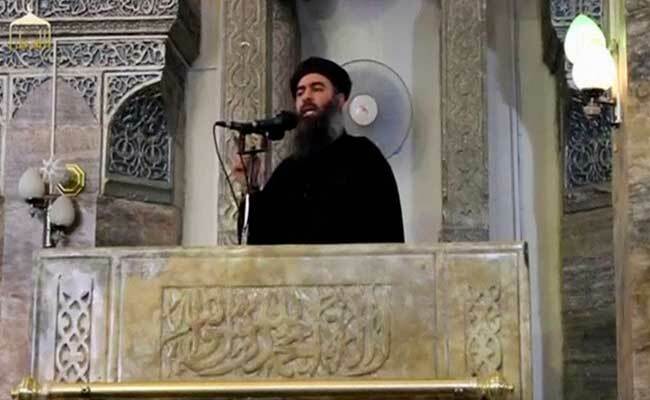 The last public video footage of him shows him dressed in black clerical robes declaring his caliphate from the pulpit of Mosul's medieval Grand al-Nuri mosque back in 2014. Born Ibrahim al-Samarrai, Baghdadi is a 46-year-old Iraqi who broke away from al-Qaeda in 2013, two years after the capture and killing of the group's leader Osama bin Laden. He is shy and reserved, Hashimi said, and has recently stuck to the sparsely populated Iraq-Syria border where drones and strangers are easy to spot. The US Department of State's Counter-Terrorism Rewards Program had put the same $25 million bounty on Bin Laden and Iraqi former president Saddam Hussein and the reward is still available for Bin Laden's successor, Ayman al-Zawahiri. "The reward creates worry and tension, it restricts his movements and limit the number of his guards," said Fadhel Abu Ragheef, a Baghdad-based expert on extremist groups. "He doesn't stay more than 72 hours in any one place." Baghdadi "has become nervous and very careful in his movements", said Talabany, whose services are directly involved in countering ISIS plots. "His circle of trust has become even smaller." His last recorded speech was issued in early November, two weeks after the start of the Mosul battle, when he urged his followers to fight the "unbelievers" and "make their blood flow as rivers". Baghdadi does not use phones and has a handful of approved couriers to communicate with his two main aides, Iyad al-Obaidi, his defence minister, and Ayad al-Jumaili, in charge of security. There was no confirmation of an April 1 Iraqi state TV report that Jumaili had been killed. Baghdadi moves in ordinary cars, or the kind of pick-up trucks used by farmers, between hideouts on both sides of the Iraqi-Syrian border, with just a driver and two bodyguards, said Hashimi. The region is well known to his men as the hotbed of the Sunni insurgency against US forces that invaded Iraq and later the Shi'ite-led governments that took over the country. At the height of its power two years ago, ISIS ruled over millions of people in territory running from northern Syria through towns and villages along the Tigris and Euphrates river valleys to the outskirts of the Iraqi capital Baghdad. A few hundred thousand people now live in the areas under the group's control, in and around Raqqa and Deir al-Zor, in Syria's east, and in a few pockets south and west of Mosul. Hashimi said ISIS was moving some fighters out of Raqqa before it was encircled to regroup in Deir al-Zor. Mosul, with pre-war population of 2 million, was at least four times the size of any other the group has held. Up to 200,000 people are still trapped in the Old City, ISIS's besieged enclave in Mosul, lacking supplies and being used as human shields to obstruct the progress of Iraqi forces by a US-led international coalition. The Syrian Democratic Forces, made of Kurdish and Arab groups supported by the US-led coalition, began to attack Raqqa last week, after a months-long campaign to cut it off. The militants are also fighting Russian and Iranian-backed forces in Syria loyal to President Bashar al-Assad, and mainly Sunni Muslim Syrian rebels backed by Turkey. The last official report about Baghdadi was from the Iraqi military on February 13. Iraqi F-16s carried out a strike on a house where he was thought to be meeting other commanders, in western Iraq, near the Syrian border, it said. Overall, ISIS has 8,000 fighters left, of which 2,000 are foreigners from other Arab states, Europe, Russia and central Asia, said Abu Ragheef. "A small number compared to the tens of thousands arrayed against them in both countries, but a force to be reckoned with, made up of die-hards with nothing to lose, hiding in the middle of civilians and making extensive use of booby traps, mines and explosives," he said. The US government has a joint task force to track down Baghdadi which includes special operations forces, the CIA and other US intelligence agencies as well as spy satellites of the National Geospatial Intelligence Agency. It will take more than that to erase his influence, Talabany said. "He is still considered the leader of ISIL and many continue to fight for him; that hasn't changed drastically," he said, using one of ISIS's acronyms. Even if killed or captured, he added, "his legacy and that of ISIL will endure unless radical extremism is tackled."